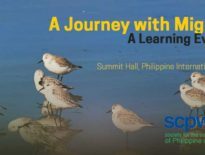 SCPW hosts EAAFP – CEPA* Working Group Workshop on Migratory Birds and Flyway Sites – The Society for the Conservation of Philippine Wetlands, Inc. 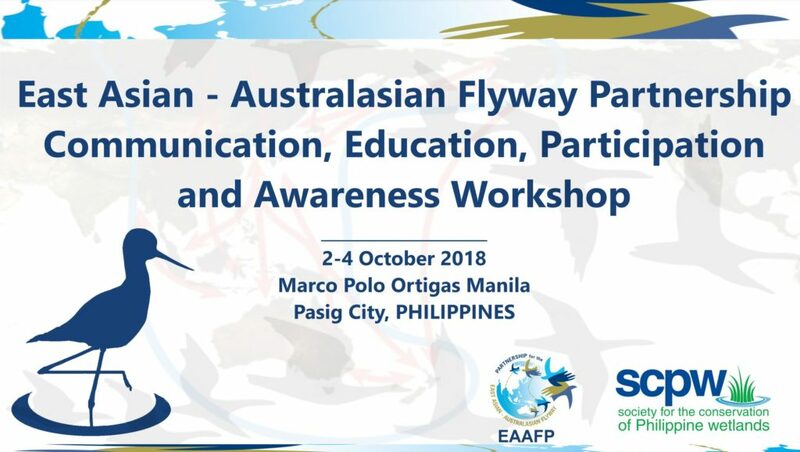 The Society for the Conservation of Philippine Wetlands, Inc. (SCPW) is hosting a workshop of the CEPA Working Group of the East Asian-Australasian Flyway Partnership (EAAFP) on 2-4 October, 2018 at the Marco Polo Ortigas Manila. The Workshop will bring together a group of experienced CEPA practitioners from across the Flyway to develop a Joint CEPA Project for the EAAFP for implementation in 2019 and to share information on successful CEPA interventions and materials. The overall aim is to inspire CEPA action across the flyway for the benefit of migratory birds and the flyway sites. The 3-day workshop includes a half-day visit to the Las Piñas – Parañaque Wetland Park (Las Piñas-Parañaque Critical Habitat and Ecotourism Area or LPPCHEA) on 03 October 2018. Present at the workshop will be participants from nine countries along the flyway together with Dr. Lew Young, Chief Executive of the EAAFP; Dr. Sandra Hails, Chair of the EAAFP CEPA Working Group; Mr. Suh Seung Oh, Executive Director of Ramsar Regional Center – East Asia; Dr. Jay Lee, Executive Director of National Geographic Society – Asia; Dr. Bernhard Seliger of Hanns Seidel Stiftung – Seoul Office; and Ms. Amy Lecciones, Executive Director of the Society for the Conservation of Philippine Wetlands, Inc. Invited presenters include: Sergei Smirenskii and Oleg Goroshko (Russia); Kim Ji Hyang and Kim Jong Ok (DPKR); Casey Burns (Alaska, USA); Vivian Fu (Hongkong, China); Hiroko Okamoto (Japan); Pyae Phyo Aung (Myanmar); Yang Shu-Fen (Singapore); Kim Wilson and Sharon Meredith (Australia) and David Laurie (New Zealand) and Ms. Rowena Bolinas, Mr. Renz Marion Gamido and Ms. Amy Lecciones (Philippines). 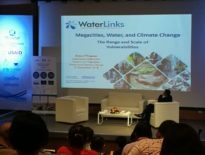 The Workshop is funded by the EAAFP Secretariat and organized by the EAAFP CEPA Working Group in collaboration with the Secretariat, and with the SCPW as host during the event in Pasig City, Metro Manila Philippines. Note: CEPA means Communication, Education, Participation, and Awareness.